Mom Loves 2 Read: Bewitching Summer Giveaway Event - Super Prizes - Amazing Giveaways! Bewitching Summer Giveaway Event - Super Prizes - Amazing Giveaways! FOUR PARTS WITH FOUR AMAZING SETS OF PRIZES! 1 Print or ebook Copy of Night Hawk by JE Taylor to US residents or ebook (mobi or epub) for international folks. If US resident would prefer ebook - that can be done as well. 1 Cindy Spencer Paper is giving away an E-book - winner’s choice of any available on her website. 1 Annie Nicholas is giving away Reader's choice of any ebook from her backlist winner’s choice of .pdf, epub, mobi. **Disclaimer: This giveaway and all information in this post was provided by Bewitching Book Tours. Mom Loves 2 Read is in no way responsible for content or prizes. I am only helping promote this event, and I have received NO compensation whatsoever. I have an old school Kindle and have been wanting and wanting a Kindle Fire for some time now. Hopefully I am lucky in this giveaway :) Thanks for participating! 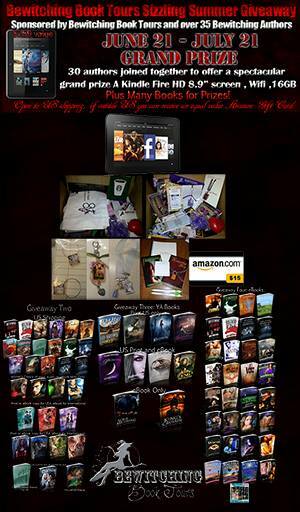 I would love to win any of the books and sets that are being offered in the second giveaway <3 I am a book-a-holic!! Um, the book addict in me started squealing when I saw this post. :) Awesome giveaway! The Kindle Fire would be wonderful!! I'm a huge fan of ebooks, but print books will always have my heart. :) Giveaway #2 is awesome. I really enjoy YA books. Thank you for giveaway #3! $200 Toys R Us Giveaway on Mom Loves 2 Read!